&#8220In 1846, Edgar Allan Poe, his wife (and cousin) Virginia, and his mother-in-law moved from Manhattan to a little wooden house built in 1812 in The Bronx’s rural Fordham neighborhood. The isolated, modest home, which rented for just $100 a year, must have suited Poe well- he wrote “Annabel Lee” and “The Bells” there. According to the blog, in 1905, the New York State Legislature set aside preservation funs, and in 1910 the house was moved to Kingsbridge Road and the Grand Concourse. New York City is a perfect location for a memorial to Edgar Allan Poe &#8211 he loved the city, any city. The Boston of Edgar Allan Poe’s birth in 1809 was one of the world’s wealthiest international trading ports and one of the largest manufacturing centers in the nation. It was also a city of squalor and vice, with a grim and ghastly underworld. It was a fitting start for Poe, whose mother and father (both actors) died when he was young. He came to be a master of the macabre weaving elaborate short stories into a shroud of mystery and death and launching a number of new American pop culture phenomenons. Poe was a man of the new American city, having lived in the five largest cities in America during his lifetime. His first published work &#8211 Tamerlane and Other Poems (1827) &#8211 was credited only to &#8220a Bostonian,&#8221 but as a young boy he was taken from his native city to Richmond, Virginia, and in his short life he also lived in Charleston, Philadelphia, Baltimore, New York City and the world’s largest city – London. Poe was a sport, a libertine, as familiar with gambling, hard drinking, and womanizing, as he was with his many literary pursuits. Known to frequent Oyster cellars, brothels, casinos, and other dens of inequity, his literary work reflects the characters he met in his own life, the scoundrels, the bawdy women, and those on the margins of society &#8211 he delighted in showing local police unsympathetically in his writing. 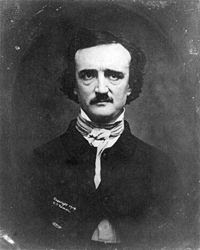 Poe was also the first well-known writer in America to try and earn a living through writing alone. As a result, he suffered financially throughout his career until the day he was found on the streets of Baltimore, delirious and &#8220in great distress&#8230- in need of immediate assistance&#8221 according to the man who found him. At the time of his death, newspapers reported Poe died of &#8220congestion of the brain&#8221 or &#8220cerebral inflammation&#8221, common euphemisms for death from a disreputable cause like alcoholism. Thanks to a disparaging, and now long forgotten literary rival, Poe’s death at 40 remains a mystery – in the end he was the personification of a genre he is credited with inventing. Poe’s The Murders in the Rue Morgue (1841) is the first true detective story. The Dupin character established a number of literary devices that inspired the likes of Sherlock Holmes and Hercule Poirot &#8211 the brilliant detective, his personal friend serving as narrator, and the final revelation offered before the reasoning is explained. But beyond inventing the detective mystery, Poe is best known as a master of the physiological horror story. The Cask of Amontillado, The Fall of the House of Usher, The Masque of the Red Death, The Pit and the Pendulum, The Tell-Tale Heart, and The Raven are disturbing and unsettling works that have found their way into popular culture in literature, music, films, and television. Poe’s writing influenced the creation of science fiction (he often mentioned emerging technologies, such as those in The Balloon-Hoax), and the areas of esoteric cosmology and cryptography. He continues to influence Goth pop culture. Poe’s most recurring themes deal with death, its physical signs, the effects of decomposition, premature burial, reanimation of the dead, and mourning. But outside horror, Poe also wrote burlesque, satires, humor tales, and hoaxes often in an attempt to liberate the reader from cultural conformity – he wrote for the emerging mass market by including popular cultural phenomena like phrenology and physiognomy. He was also a literary critic, and a newspaper and magazine editor.